ShermansTravel Media, Savoteur, Brit + Co, HomeChef, and Lucky Peach have joined forces to offer culinary fans a chance to enter once to win a trip to Minneapolis worth more than $3000! 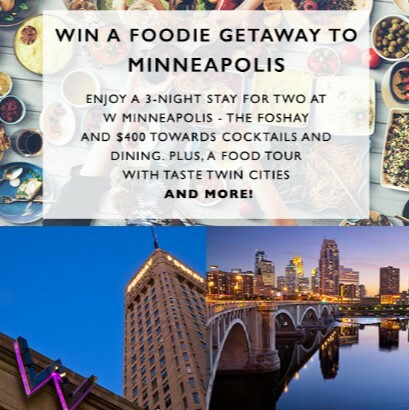 PRIZE: (1) A 3-night stay at W Minneapolis - The Foshay including $400 dining stiped that can be used at Manny’s Steakhouse, Prohibition and The Living Room (2) $800 towards airfare for two (3) $500 voucher to HomeChef (4) Tickets to the special exhibitions at the Minneapolis Art Institute (5) A food tour of Minneapolis with Taste Twin Cities (6) Four Tickets to the Sea Life Aquarium (7) Trove of Lucky Peach back issues and cookbooks Total Approximate Retail Value (“ARV”) of Prize: $3,040. This Sweepstakes ends on 07/06/16 and you can ENTER ONCE to win.